Here are some of the major Industrial Automation projects we have completed. ASD provided complete Electrical & Control system engineering design, CAD drawings, programming and start-up commissioning in all of these projects. AKT/Applied Material – 2 Axis Z-Drive linear absolute positioning system. Achieved repeatability of 10 microns in 300K cycle tests with Yaskawa SMC 4020 Motion Controllers and Legend Servo amplifiers. Also provided protocol gateway between existing EBT communication protocol and Yaskawa communication protocol using Panasonic/Aromat controller. Papercon , USA – Rotary knife Cut to Length system with cam control and registration mark correction for printed paper with Yaskawa Sigma II Servo system and Yaskawa MP940 Motion Controller. Redlion HMI was used as operator interface communicating to Yaskawa controller. UFO , USA – Sponge edge profiling & cutting machine 2 axis cam control with Yaskawa Sigma II Servo system and Yaskawa MP940 Motion Controller. Disney Imagineering Group, USA – Motion Control system for the Walk On the Moon Theme park application utilizing custom embedded controller software written for Yaskawa AC Flux vector drives. Vertex Group, Japan - Industrial PC based Motion Control system for the Hoberman Sphere Music Synchronized Motion with Xycom touch screen PC, ASIC200 PC based Motion Control software, Opto-22 I/O and Yaskawa AC Flux vector drive. Mega Machinery, New Zealand project - Industrial PC based control system for the Plastic Sheet Extrusion, Cooling & Polishing line with Advantech touch screen PC, TEOS SCADA software, Eurotherm Temperature Controllers and Yaskawa AC Flux vector drives. 1 Line with 500HP Extruder. Mega Machinery, Mexico project - Industrial PC based control system for the Plastic Sheet Extrusion, Cooling & Polishing line with Advantech touch screen PC, TEOS SCADA software, Eurotherm Temperature Controllers and Yaskawa AC Flux vector drives. Total 2 lines with 1000HP Extruder. Kama Industries, USA - Industrial PC and PLC based control system for Plastic Sheet Extrusion, Cooling & Polishing line with Xycom touch screen PC, Iconics Genesis SCADA software, Siemens TI PLC’s, Powertec Brushless servo drives and Warner winder controls. 1 Line with 300 HP Extruder. PTI Corp., USA - Industrial PC and PLC based control system for the Paper Coating and Winding line with Advantech touch screen PC, Custom Visual Basic SCADA Software, Entrelec PLC, Warner-SECO AC vector drives and Dover Flexo tension controls. Raychem Corp., USA - Industrial PC and PLC based control system for the Plastic Sheet Expander line with Xycom touch screen PC, USData Factory Link SCADA software, Allen Bradley PLC, Eurotherm AC vector drives and Megatronix tension controls communicating with each other on a DeviceNet network. 3M Corp., USA – Thin Film Plastic Sheet Cooling & Polishing laboratory test line control system with Allen Bradley PLC, Reliance Servo Drives, and Dover Flexo Tension Control system. Solvay Draka, USA - Plastic Sheet Coating and Winding station cascade speed control system with EMS AC vector drives and Honeywell ultrasonic tension control. Macbee Engineering , USA – Sensorless Constant Tension Center Winder control system with traverse control for Wire drawing machine utilizing custom embedded controller software written for Yaskawa AC Flux vector drives. Logic control with Allen Bradley PLC. Linktek, USA - PLC based control system for the Waste Water Treatment Plant with AB PLC, Cimrex HMI, Rochester Alarm System, Texmate Single-Loop Controllers, ABB AC Flux vector drives ASD designed and commissioned the complete electrical control panel. 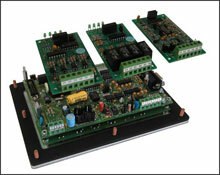 Total 678 I/O and 65 Motor Starter circuits. Go to Applications/Waste Water Treatment for more details. Condor Healthcare Services, USA - PLC based control system for the Hospital Waste Disposal machines with Aromat PLC, Cimrex HMI, Yaskawa AC Flux vector drives, built-in Internet Web communications and electrical control panel. Macbee Engineering , USA - Industrial PC and PLC based control system for 6 pass Wire drawing machine with Advantech touch screen PC, TEOS SCADA software, Allen Bradley PLC, Yaskawa AC Flux vector drives communicating with each other on a Profibus network. Mitsubushi Heavy Industries, Japan - Industrial PC and PLC based control system for the test stand of the Tokyo Disneyland theme passenger cars 300 HP Drives PC based Torque performance and Ride Simulation, Think&Do PC control software, Koyo PLC and Yaskawa AC Flux vector drive. MetalCrafters , USA - PLC based control system for the prototype of Lexus Sports car convertible roof mechanism. Designed and programmed the stepper motor actuated roof opening/closing mechanism with Aromat PLC. 14 Stepper motors and 32 proximity sensors were used. Communication gateway devices design & programming for Ethernet, TCP/IP to Serial communication interfaces. Serial side protocol can be any serial communications protocol including Modbus RTU, ASCII etc.